Hotel Atlantis ****superior Medical, Wellness and Conference Hotel is located in the centre of Hajduszoboszlo, close to the thermal spa of the city, only 20 km away from Debrecen and 30 km from Hortobagy. Hotel Atlantis can be easily reached from the main street no. 4 or from the M3 and the M5 highways. The hotel provides a perfect location not only for those who are looking for perfect refreshment but also for business travellers. 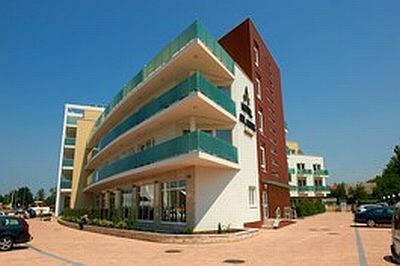 The excellent hotel services are completed with the entertainment venues of Hajduszoboszlo - vintage train, quad race track, adventure park and Bringohinto (a bike alike vehicle with four wheels for four or more people). Hotel Atlantis**** superior Medical, Wellness and Conference Hotel offers 97 rooms on 7 floors with 13 suites, 1 special suite and 1 single room for handicapped people, 1 hypo-allergen room and two luxury suites with own jacuzzi among them. Every room has balcony, individually controlled air conditioning, WIFI and cable Internet access. Superior rooms are equipped with LCD TV (Pay TV), telephone, minibar, safe and cable/WiFI Internet access. In the bathroom shower, hair dryer, cosmetic mirror, bath towel, bathrobe, slippers, cosmetic and hygiene-set are available. Superior single rooms have one large single bed, Superior double rooms are equipped with one large double bed (double room) or two single beds (twin room). Extra bed can be placed in this room type. The suites offer perfect accommodation solution for up to four people and for families with young children. The suites have a large double bed and a canapé for 2 persons. The suites are equipped with air-conditioning, LCD TV (Pay TV), telephone, minibar, safe and cable / WiFi Internet. In the bathroom shower, hair dryer, cosmetic mirror, bath towel, bathrobe, slippers, cosmetic and hygiene-set are available. The luxury suites offer perfect comfort for up to 4-6 people completed by the lovely panorama and the own balcony. The luxury suites has own jacuzzi and are equipped with air-conditioning, LCD TV (Pay TV), telephone, minibar, safe and cable / WiFi Internet. In the bathroom shower, hair dryer, cosmetic mirror, bath towel, bathrobe, slippers, cosmetic and hygiene-set. WiFi Internet connection is available everywhere inside the hotel. The terraces of Hotel Atlantis offer a great view of the 30 hectare area of the Hungarospa thermal bath and the buildings of Aqua Palace. In the rooms of Hotel Atlantis pets are not allowed. The restaurant of Hotel Atlantis****superior Medical, Wellness and Conference Hotel with the capacity of 150 people offers a'la carte specialities and buffet menus. In the restaurant guests can choose from the region's most famous dishes as well as the representatives of the international cuisine. The grill-terrace can host 230 persons and creates a great atmosphere with show kitchen and live music. In the hotel bar guests can choose from several coffee and tea specialities, more than 20 sorts of cocktails, delicious cakes and ice cream. In the approx. 900 m² wellness area of Hotel Atlantis****superior Medical, Wellness Hotel guests can find a special atmosphere where swimming pool, experience pool with light and entertainment elements, thermal water pool, children's pool, Finnish sauna, infra sauna, bio sauna, steam cabin, salt chamber, ice chamber ensure the regeneration and the refreshment of both body and soul. Sauna seances, massages, aqua fitness programmes serve our guests who seek relaxation or active holiday. The wellness department provides wide range of wellness treatments, for example: honey massage, My Hsin-Ni beauty mask facials, Thai massage and Tibetan massage. The 35 m² fitness room, equipped with modern cardio-machines completes the high standard wellness services. In the medical department the rheumatological diseases are treated by special treatments: therapeutic bath pools, thermal water pools, medical massage, underwater jet massage, carbon acid bath, parafango, electrotherapy, thermo, ultrasound and underwater ultrasound therapy are available. The hotel's conference rooms, equipped with modern, up-to-date technical equipment are perfect venues for organizing trainings, boardmeetings and business meetings. Acommodation with half board, the use of Atlantis wellness and bathing establishment (swimming pool, experience pool with light and entertainment elements, thermal water pool, children's pool, Finnish sauna, infra sauna, bio sauna, steam cabin, salt chamber, ice chamber, fitness room), bathrobe use, Internet connection, VAT. Children between 3-12 years get 50% discount from the per person price in extra bed. The booking will be definite after the bank transfer of 10 % of the whole sum in advance. Cancellation is free of charge 48 hours prior to arrival. In case of late cancellation or no show the in advence sum will be charged.